Lifestyle brand Lacoste has officially announced the release of its free mobile app Lacoste City Tennis on iOS and Android devices. The app offers localized content to tennis fans in the New York City area, helping them find other tennis fans for matches. In addition, the app offers mobile shopping for Lacoste’s gear, as well as a tennis-themed mini-game for passing the time. In this launch version of Lacoste City Tennis, local content is targeted at the New York City area, but will expand to other cities, including Miami and Los Angeles throughout 2015. 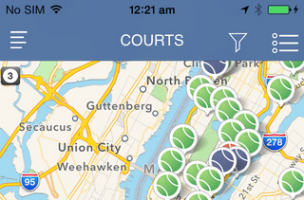 Users can view a map of all nearby tennis courts, tapping on each to see their availability (whether they’re a public or private court, for instance), location and more. Users can create their own profiles, and search the profiles of others to find potential matches. Each profile contains lots of information, including the age range of the player, their gender, their self-described skill rating and preferred match days and times (weekends or weekdays, mornings or afternoons). When a user finds someone they’d like to play against, they can message them within the app to schedule a time or place to meet up in the real world. Outside of this content, players can explore the World of Lacoste, viewing the company’s social media feeds on Twitter and Facebook , as well as browsing Lacoste gear. Each product comes with an item description and link to purchase it on the Lacoste website. The app also includes the ability to virtually “try on” items by laying them on top of an image from the device’s camera. The app offers two feeds for following news content about tennis, and is rounded out by a tennis mini-game in the style of Flappy Bird. In the game, users tap on the screen to bounce a tennis ball into the air, and must guide it through gaps between tennis rackets, nets, chairs and other obstacles. High scores can be shared with friends via Facebook or Twitter. Lacoste City Tennis is available to download for free on iOS and Android. For a limited time, users who visit participating boutiques and show they’ve downloaded the app will receive free single-play passes (worth $15) for NYC tennis courts.